This weekend Julia and I took a drive out to Joshua Tree National Park. A family friend owns a vacation property in the town of Joshua Tree, and generously offered it up for the weekend. I always forget just how close the park is, and I was surprised when we arrived in under two hours of driving. Maybe it’s the 10+ hours I spent driving home from Moab two weeks ago that’s given me a new perspective on long drives, but I didn’t even have time to get deep into my best road trip playlists! The first thing we did upon arriving to Joshua Tree, was make our way to our house for the weekend. The location was absolutely perfect, really close to the park, and sitting on a lot of land. I almost talked myself out heading into the park, as an afternoon spent relaxing on the patio felt awfully tempting. The calls of the Joshua trees, stacked boulders, juniper, and Mojave yucca were too strong to resist. I also wanted to get a nice hike in, and I had yet to summit Ryan Mountain. Ryan Mountain is a 5,456 mountain in Joshua Tree National Park. The trail gains a little over 1000ft and is 3 miles roundtrip. The first half mile of this hike climbs upward on a set of stone steps. With each step I climbed, the views around me grew in stature. The Saturday afternoon sky was a deep blue, and painted by the wispy strokes of cirrus clouds. The singletrack took me south with views of boulders and mountains all around me. After heading south, the trail takes a left hand turn and cuts between Ryan Mountain and the hill nearby. Once you’ve made it through the crease in the mountains, the majority of the uphill climbing is over. All that remains is a short walk towards the summit. I was really enjoying the views on this section, as the direction of the trail switched from south and east to north and west. A huge pile of rocks marked the summit of Ryan Mountain, and also provides a bird’s eye view of the park once you climb on top. The weather was perfect, and I couldn’t have asked for a better sky. After hiking Ryan Mountain, I met back up with Julia, Isla, and Lilly, and we did a little more exploring in the park. This is a National Park that’s considered “in our backyard” and one we visit frequently. I love the liberty this gives me. Usually when I visit a National Park, I have the urge to see everything and take in as much as I can. I always live with the thought of “I might never be back to see this!”. Luckily, Joshua Tree is a close enough drive that I can really take advantage of my National Park annual pass, and see each section slowly. On this day, we really wanted to get back to the house the was so generously offered to us, so we only made a few short stops before leaving. After leaving the park, we all drove into Yucca Valley to pick up some things for dinner. For those unfamiliar, Joshua Tree sits in between Yucca Valley and 29 Palms. There are a lot of great restaurants, art shops, cafes, boutiques, and other sites to see in the this corridor. Don’t miss it if you’re visiting the park! It’s worth taking at least an extra half day to explore all of the fun things outside of the National Park area. Heading out for a day for Christmas – can’t wait! Nice! We did that last year. It’s a great time to visit! Your puppies are great models! Joshua Tree is on my 2016 to-do list. Do you feel you have to do a significant amount of hiking to get a good feel for the park? Thank you! It’s easy to get them to pose when I’m holding a treat behind the camera! 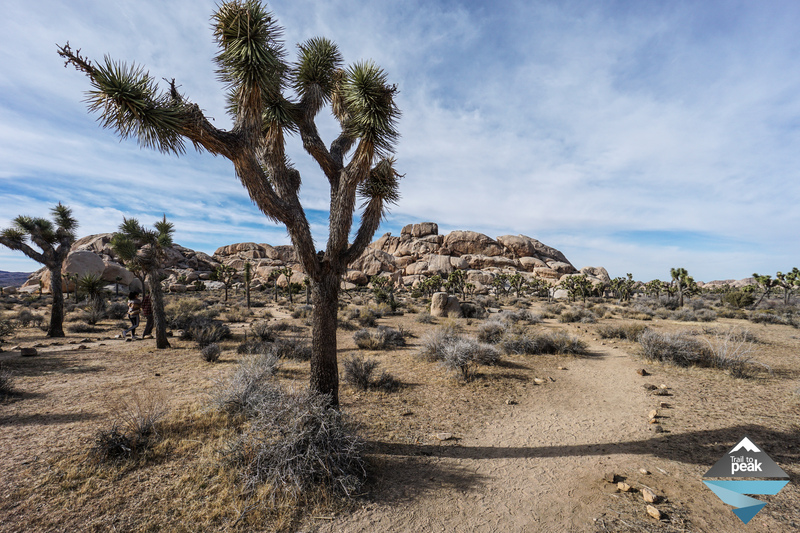 Joshua Tree is a great park in that it has something for everyone. I’ve visiting on days where I only did hiking, but have also visited on days where I stayed in the car most of the time. There are a lot of short trails and loops that allow you to get a great feel for the park without a lot of hiking, but a lot of the historical destinations and points of interest require a little bit of a walk. Next time you’re there, check out the Pine City Trail. The first part is marked and then you get into an awesome playground of boulders. Great park! Sadly I’ve been reading about the decline of the Joshua trees due to ongoing drought. I’ll have to check that out! You’re right about the trees dying out. This drought is really having a heavy impact on the trees. This El Nino was supposed to be our savior, but so far we haven’t seen much rain. We’ve had a nice bit of rain this week, but it’s only the 3rd storm of the year. Hopefully we get a lot more in the new year. I have been there a number of times. It is probably my favorite park in California. I did a photography retreat hosted by the park there many years ago. I have always been meaning to do a post but all of my photos are in paper version! Did you by chance see the old cattle ranch there? It is a cool spot to visit because it feels like a ghost town with things just laying around burnt by the sun. You photo of the car reminded me of it. Thanks for bringing back good memories. I can’t wait to get back there again some day. It’s one of my favorites as well. How cool that you were able to take part in a photography retreat in the park. I’ll bet that was a lot of fun! I didn’t see the old cattle ranch on this one. I’ll have to check that out next time. We go so often that we only do one or two things each visit. I hope you get a chance to visit again soon! Me too. I was actually thinking it would be fun to go down there and do it again with better equipment. Check out the ranch. It’s pretty cool. I will be there in few weeks. Ryan Mountain is on my list. Nice photos! 😊What a timing for your post! Can’t wait! !